Why, you might wonder, has Kia added a hero car with limited appeal (manual transmission only) to a cluttered, highly competitive compact car market? The answer is: because it could. The model in question is the Picanto micro and the latest addition to the range, the GT. 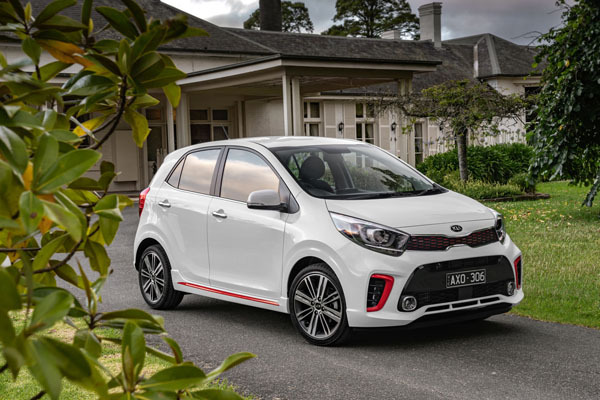 According to Kia Motors Australia Chief Operating Officer Damien Meredith the company was happy with how the Picanto had gone over its three years of on sale Down Under. “With that in mind it seemed like the right time to give an opportunity to a sporty version of the car, one for which there has been a constant undercurrent of demand,” he said. “That car is the three-cylinder 1.0-litre Turbo, featuring all the great bits of the standard Picanto but with an attitude and athletic ability destined to make friends with lots of smiles,” he added. With 74 kW and 172 Nm channeling through the front wheels via a five-speed manual transmission, plus a suspension tuned for Australian conditions, the company believes it has the motor for the moment, all for less than $20K. Picanto GT stands out with contrasting body highlights – the test car red on Titanium Silver – twin exhaust, a body kit and GT badging. The Picanto range’s straight-backed stance means there is ample head room in the rear for average-size passengers and the ability to maximise the 255 litres of luggage space. This is easily increased to 1010 litres by folding the 60:40 second-row seat backs. Shoulder space out back is limited, especially with three adult passengers abreast. Headrests are adjustable vertically, rare in this grade of vehicle. 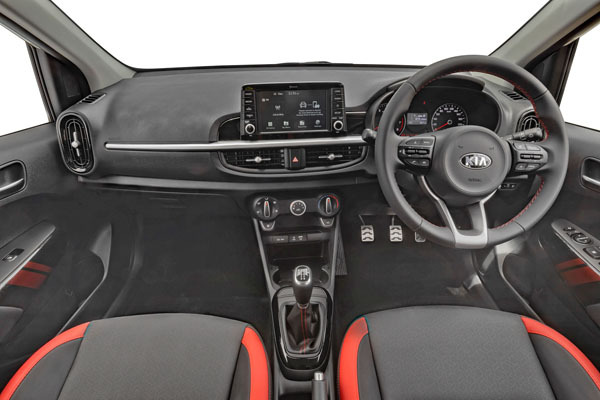 Convenience in the Picanto GT is extensive, including Bluetooth connectivity, four-speaker audio system, steering wheel-mounted audio controls, Android Auto and Apple CarPlay. The 1.0-litre engine develops 74 kW at 4500 rpm and 171 Nm of torque between 1500 and 4000 rpm. A single-scroll turbocharger is paired with an electric wastegate motor improving performance while grabbing clean air for the engine. At the same time, it allows the wastegate to open to improve the flow of exhaust gases. As well as being more efficient, the engine is cleaner, thanks to a one-piece manifold improving sealing, reducing weight and lowering exhaust gas temperatures. Lower temperatures result in cleaner emissions by allowing the catalytic converter to operate more effectively. Extensive safety features include autonomous emergency braking, six airbags, ABS anti-skid braking, electronic stability control, hill start assist, vehicle stability management, torque vectoring, forward collision warning and straight-line stability. The engine exhibits minimal lag between the driver pressing the accelerator and the turbocharger delivering boost and, therefore, sporty acceleration. Kia weighed this up against fuel efficiency and went for the manual transmission against an auto, thus delivering a more engaging driving experience. It was during this drive that the benefit of a suspension tuned especially for Australia by Kia Motors Australia’s ride-and-handling team came to the fore. Through a more aggressive tune for the shock absorbers and a stiffer spring rate the team was able to provide greater body control with better road feedback as well as reasonable ride comfort. Meanwhile, changes to steering mapping give a quicker response and enhanced stability when under load, while lower profile 195/45 R 16 rubber on 16-inch alloy wheels improve both grip and directness when pushing the limit. If there is one let-down, it’s the five-speed manual transmission, which is a bit yesterday, with many modern manuals featuring six cogs, and automatics up to ten. Shifting was floppy, far from slick and sporty, on the test car. Combined urban / highway cycle fuel consumption is put at 4.8 litres per 100km, with a city cycle of 6.2 litres per 100 and 4 litres per 100 kilometres on the open road. During our week’s test with a mix of city and country driving our GT registered an average of 5.1 litres per 100 kilometres. 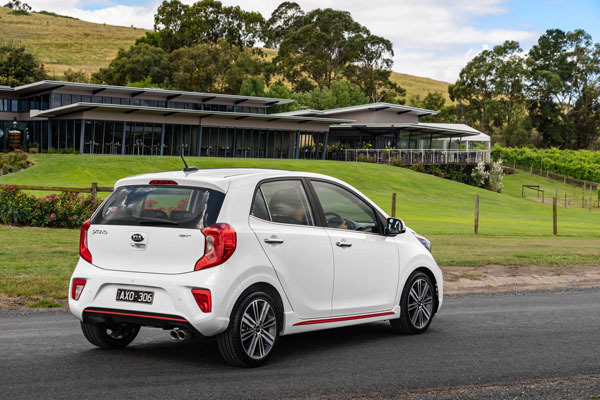 Kia confidence in the top-shelf Picanto GT could be catching, with the balance between extensive Picanto standard equipment and something special for the individual owner. Then there’s the Kia industry-leading seven-year warranty, of course.